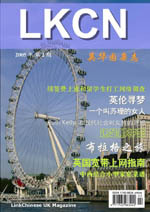 LinkChinese Network launched a new magazine in 2005. The new magazine, which is published both online and in print form, is called LKCN Magazine, or Ying Hua Yuan Zazhi in Chinese. LKCN Magazine is aimed to create a new medium for Chinese students and professionals in UK to express their views and share their experiences. LKCN Magazine will provide space for young generation of Chinese to voice their thoughts on current affairs, culture and traditions of UK and China, UK's education system and other topics about which they concern most. It is also a place for them to share experiencs in every day life, education, job hunting, and traveling. In the second issue, LinkChinese UK published its survey on visa fees and part time jobs. The survey shows that about 95% of Chinese students object the huge increase of visa processing fee announced by the Home Office. About 60% of the students said they had to extend their visa in last 12 months. The same percentage of the students said they would have to extend their visa in 12 months time. Students from China often need to take language course or foundation course before being enrolled into UK universities, which makes them most likely have to extend their visa during their study. Oxford University PhD student Yang Jing critised the visa extension fee hike as "short sighted". "Chinese students not only bring direct economic benefit to UK universities, but will also help to build the cultural and business links between the two countries. Collecting huge visa fees will only undermine the competitiveness of UK universities." says Yang Jing. LKCN Magazine is an independent magazine. The editors are working as volunteers at the moment. Any support is welcome to help the magazine to develop and flourish. If you are able to help the Magazine, please contact uk@linkchinese.net.